The idea of a Careers Show on Community Radio was conceived during April 2006 when a local steering group. Chaired by Jim McHarg of Community Learning & Development set up a radio station called GVFM (Garnock Valley FM). This group had been granted a four week broadcasting license and my idea was to take careers information into a new medium and this provided the ideal opportunity to experiment. The initial concept I had was a show to highlight various careers interspersed with music and local information and the four week run of the show proved very successful. GVFM was later granted a further four week license and from there the show grew from strength to strength. The Careers Show has been broadcasting a weekly slot since. all carried out by myself and I have recently been provided with an assistant who helps with the arranging of interviews. This assistance was required due to the overwhelming success of the show and we are now at the stage where not only are we contacting potential interviewees but they are now contacting us e.g. interviews range from the First Minister to astronauts to catering staff to apprentices. We hope to further develop the Careers Show concept by syndicating to other stations throughout Scotland and the UK and these discussions are on going at present. promotion of local musical and sporting talents, a local and national education/employment News round slot, ethnic and disabilties and we are now accessible via social network sites such as Twitter, Bebo and Facebook. ‘Ask Eddy’ section for any questions on careers and a possible ‘Careers Show Road Show’. The Careers Show has also won recognition via UK, Scottish and international awards. 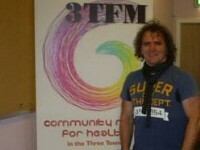 You can listen to the show live every Friday between 1-3pm on 103.1 and www.3tfm.org online.